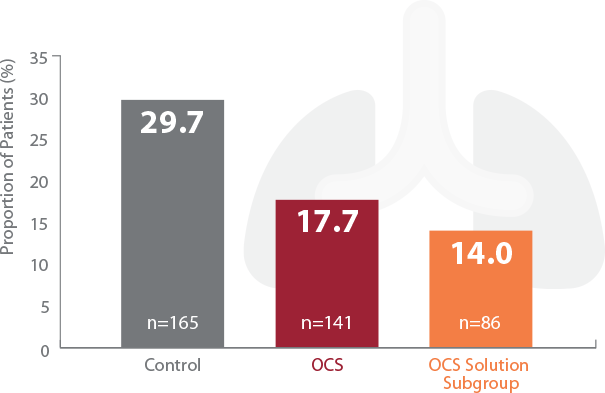 The OCS Lung is a portable perfusion, ventilation, and monitoring system that maintains the organ at a near-physiologic state – allowing physicians to assess and improve the condition of lungs between the donor and recipient sites. *PGD3 is the most common and severe clinical complication of lung transplantation and is a predictor of short and long-term morbidity and mortality post transplantation. TransMedics OCS Lung significantly reduced PGD3 vs control group in the INSPIRE Trial. International pivotal trial to evaluate the Organ Care System for use with unutilized donor lungs that may not meet current standard acceptance criteria for transplantation. The OCS Lung is FDA approved for use with utilized donor lungs. It is currently under FDA review for use with unutilized donor lungs. The OCS Lung is CE marked and commercially available in Europe and Australia. The OCS Lung, OCS Heart and OCS Liver are all CE marked devices. The OCS Lung is an FDA-approved device for utilized donor lungs. The OCS Heart and OCS Liver devices are investigational devices and, therefore, are limited by federal law to investigational use in the US.